It helps that Harper embodies Ibbitson’s own theory about the direction Canada is taking in the 21st century. In his 2013 book, The Big Shift (co-written with pollster Darrell Bricker), Ibbitson argues that the Laurentian elites – the political, cultural, business, and media classes grouped in the cities of Toronto, Ottawa, and Montreal that have defined the nation’s power structure for the past 150 years – have seen their influence usurped by a coalition made up of the energy-rich West and immigrant populations in suburban Ontario (and elsewhere). These groups tend to be more socially and economically conservative than their eastern urban counterparts or native-born Canadians, and it was this combination that handed the Harper Conservatives their majority in 2011. “This shift is permanent,” Ibbitson and Bricker write, making the approach and tone in Stephen Harper appear something of a self-fulfilling prophecy. It is foolish in the extreme, Ibbitson argues, to blame a conservative government for acting like conservatives. And the current government is, at least in Ibbitson’s view, the first truly conservative government in Canada’s history. (The author makes it clear that one of Harper’s biggest hesitations in contemplating the merger of the Canadian Alliance with the Progressive Conservatives was his antipathy to the red Tory tradition that persisted in the latter party.) Harper’s ideology was forged by his roots in Toronto’s suburban Leaside neighbourhood in the 1960s, combined with western disaffection stoked by his involvement with the Calgary School of academics and a sympathy for the economic theories of Friedrich von Hayek (whom Ibbitson calls “any good conservative’s answer to John Maynard Keynes”). Harper believes in a smaller, less intrusive state, a strict separation of powers between the federal and provincial levels of government, lower taxes, and more emphasis on the free market economy. He has provided all of these things. Unfortunately, in so doing, he has also embarked upon a scorched-earth policy of cuts to services and agencies such as Library and Archives Canada and the CBC. His government is responsible for the so-called Fair Elections Act, which benefits the Conservatives by making it harder for likely opponents to vote in federal elections; Bill C-51, the astoundingly overbroad government surveillance legislation that even many Conservative supporters have expressed concerns about; and tough-on-crime legislation that increases penalties and restricts rehabilitative measures while ignoring the fact that crime has steadily decreased since the 1990s. If Ibbitson mentions these things at all, he generally glosses over them, or spins them in such a way that they sound much more palatable than they actually are. He expends little time or effort examining some of the other less-than-savoury things Harper has done in office: muzzling his government’s own scientists when they dare to disagree with their pro-oil bosses on climate change; pulling out of the Kyoto Protocol; claiming that the epidemic of missing and murdered aboriginal women “isn’t really high on our radar”; and presiding over the first government in Canadian history to be found in contempt of Parliament (over its refusal to disclose the true cost of purchasing a fleet of F-35 fighter planes). And this is by no means a comprehensive list. Ibbitson’s sleight of hand is in employing his own steady, measured tone to convince the reader, despite all evidence to the contrary, of the reasonableness of this latter position. The author is guilty of descending into pettiness when it comes to Harper’s antagonists (Joe Clark, in predicting the Alliance/PC merger would make Canadian politics less competitive, was “wrong, for the umpteenth time”; Belinda Stronach “was weak on policy, weak on communications, weak on – well, you name it”), but he extends to the man himself the benefit of every doubt, and moderates his tenor to the point that it becomes, at times, almost comical (“There are disagreeable aspects to Stephen Harper’s personality,” he informs us at one point early on). This deference results in some discordant moments. The Conservatives’ signature Federal Accountability Act, Ibbitson writes, “ensured that Ottawa would never have its own K Street, the thoroughfare in Washington where powerful lobbying firms practically dictate the legislative agenda of Congress.” Perhaps, but if the author doesn’t at least suspect that Big Oil is instrumental in setting policy (see, for example, the Keystone XL pipeline farrago), he is either hopelessly naive (which he clearly is not) or wilfully blind. Then there is the author’s lack of inquisitiveness regarding how much Harper knew about the $90,000 cheque his former chief of staff, Nigel Wright, gave to Mike Duffy to repay certain dubious expenses the senator had claimed. “[T]here was much to be said for what critics derided as Harper’s control-freakish handling of his office,” Ibbitson writes at one point. 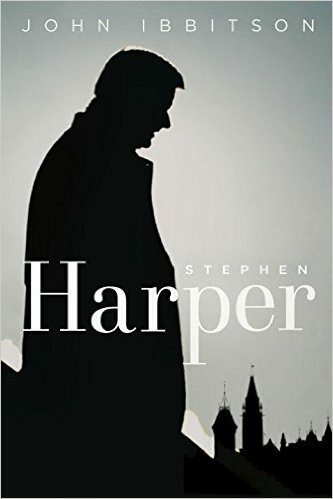 “He knew, for one thing, exactly what was going on in it.” And later, “Nothing of importance is decided until the PM signs off on it.” How, then, can Harper claim not to have known about Wright’s interference with Duffy? For Ibbitson, the question remains unanswered.